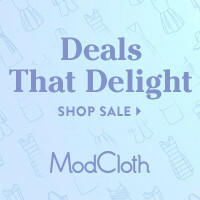 Now through Friday, 3/28 @ 10am PT save 20% ModCloth’s fave spring styles. Continue reading on how to enter to win a $350 gift card in the ModCloth Twirl Around the World Contest. Two winners will be selected! Show off your twirling capabilities with the ModCloth ‘Twirl Around the World Contest’ and you could win a $350 gift card! Snap a photo of yourself twirling in your favorite spring ensemble and upload to the Style Gallery or post on your Instagram account with the hashtag #modtwirl. Videos will also be considered on Instagram. Contest ends 3/31 at 10am PT. One Instagram winner and one Style Gallery winner will be chosen on 3/31 by EOD.